When I painted this batch of small watercolor paintings I did it like a nerd with a GoPro strapped to my chest. Here’s how that turned out. I’m trying to learn video editing and putting that together took WAY longer than it should have. Now that I have five months of GoPro video collected it would be really nice to do something with it all. 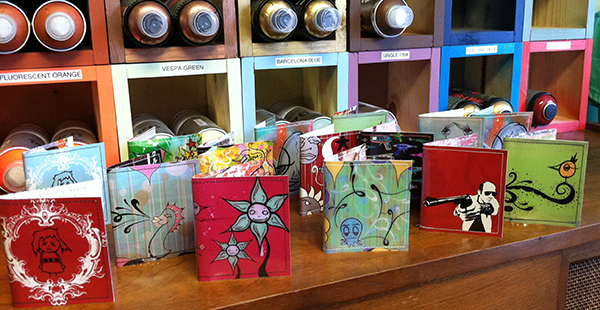 All of those painting are still available and in the shop. Oh yeah, sorry if you got motion sickness watching that. Working small as of late. Sometimes working small is great because it can make you feel more accomplished. Just the act of finishing something feels good. Especially, for art procrastinators like myself with a dozen or more unfinished paintings in the studio. Speaking of studio, have you seen where I’ve been working the last month? Here are some new ACEO’s, which are business card sized paintings. 2.5″ x 3.5″ – watercolor and ink on paper. 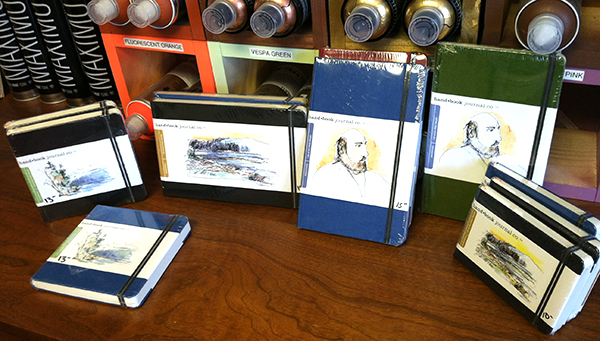 If you purchase any of these ACEO paintings I found some nice frames for them at Michael’s. They were double matted and the opening was made for this size of art/photo. I’m sure Aaron’s Brothers and other similar stores all have at least one frame that would work for this size. 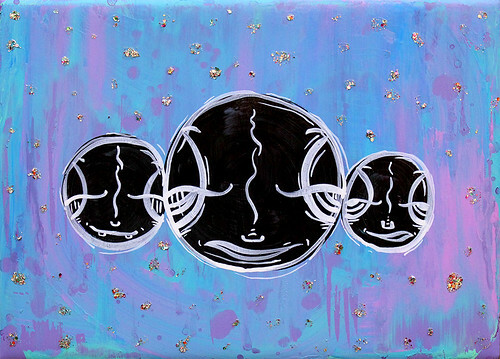 And here are three new 4″ x 6″ paintings done in the same style, just bigger. These are a much more common size and every place that sells frames will have a lot to choose from in this size. 4″ x 6″ – watercolor and ink on paper. You can also see all my available original paintings right here. Aww…People Think About Me. And For Totally Different And Unrelated Reasons. So, a few days ago I received three different messages from three different people that went out of their way to show/tell me something that reminded them of me. And that just makes my heart all mushy. My photographer buddy, Tom, thinks of me when he buys india ink because he knows I’m a sucker for the stuff. My friend Amy discovered this amazing Thai tea thing-a-ma-bob and thought of me because she knows I’m a sucker for the stuff. I haven’t tried it yet, but next time I find myself in the vicinity of a Fresh & Sleazy you can bet your sweet Thai tooth I am going to try one out. And my lovely lady, who is one of the few people that is privy to all my crude, perverted and disgusting humor, found this gem. With a name like Fart Magazine, would you expect anything less? I certainly hope not. Now, if only they’d provide a list of the songs on that mix cd. If you would like to purchase this painting please order online. I’m still super into the white ink on dark colored backgrounds. Fun stuff. Here’s a peek at what is currently available in the gallery. I’ll be open tonight from 6-9pm during Downtown SLO’s Farmer’s Market. We are down to 15 colors of paint. Here’s a breakdown for you. Along with spray paint we also have various caps as well as markers and ink available. We are down to one green Sakura Solid Marker, also known as a “streaker”, $4.50. One Krink K-71 in red – $8.00. One MTN 94 marker in yellow – $8.00. One Jumbo Pilot in blue – $3.80. All of these are on sale! There are a couple of used ones, which are on sale for $6 each. The few that have never been opened are $12 each. 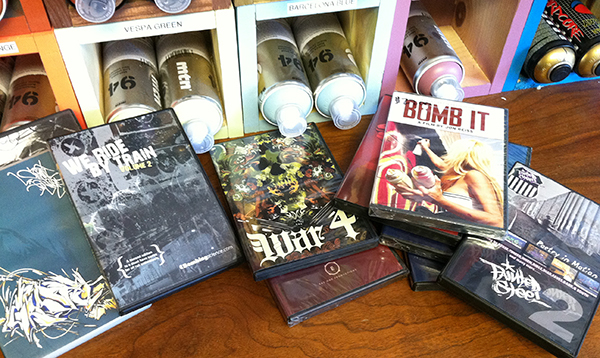 This included “Bomb It”, which retails at $27. 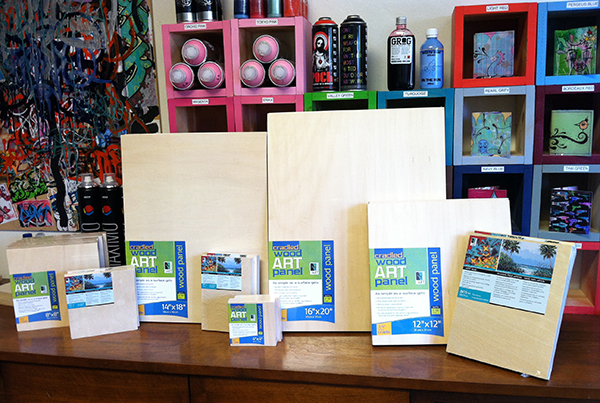 If you haven’t started painting on wood, now is your chance! We have a lot of these super awesome high quality wood panels available right now. Of all the sketchbooks I’ve tested and used over the years these have the best quality paper I’ve ever come across. For reals. These are all handmade and super cool. 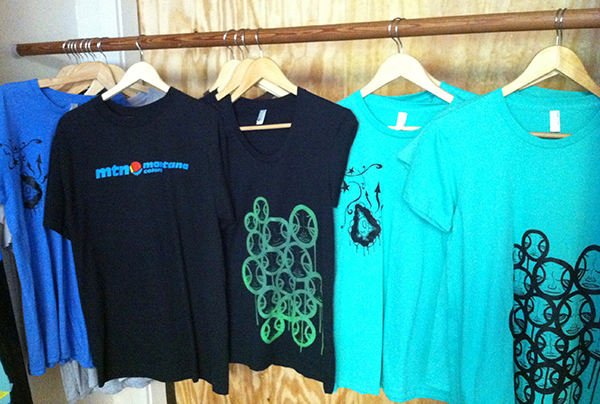 All shirts are on sale for $10 each! This wall is all original work. 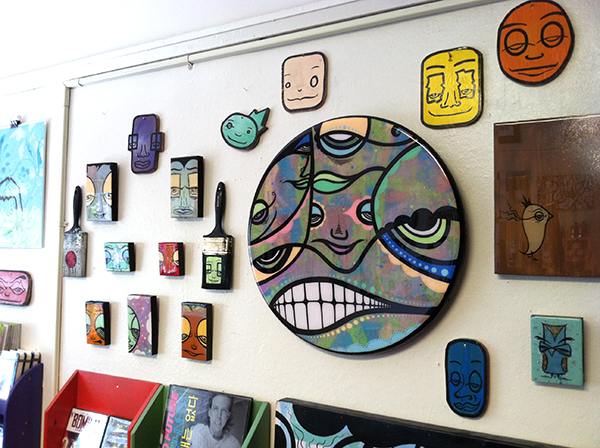 The “blockhead” pieces to the left of the big round painting normally sell for $40-$65. Tonight, they are all on sale for $20 each. 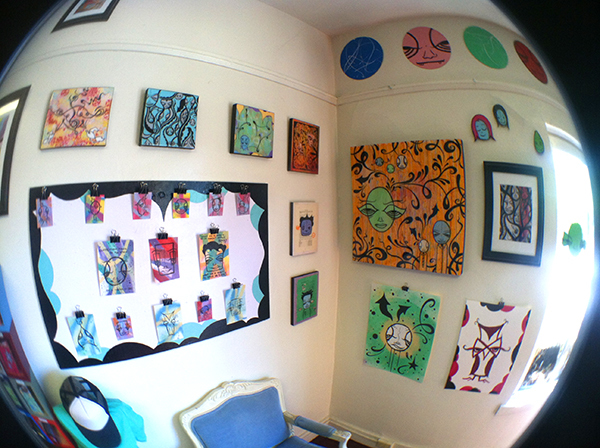 This corner is a mix of original paintings and limited edition prints on wood. Well, that turned out to be a pretty informative “sneak peek”. I hope you can swing by tonight to say hi and pick up some goodies. I know I know…Friday is almost over, but let me tell you, it’s been a busy day. I won’t get into the details because that’s a whole post of it’s own, but I will say this. It was good being busy. I had a great night. 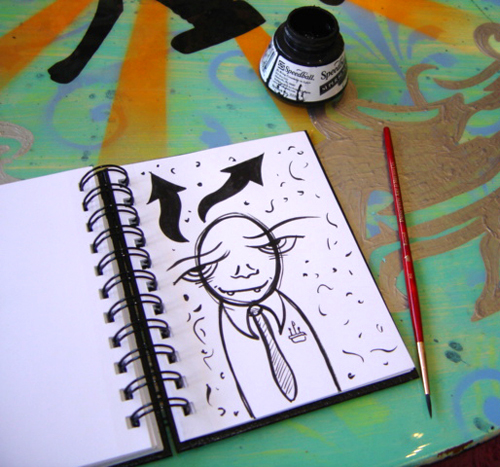 For today we are going through Sketchbook #9, which I drew in from June 2002 – May 2003. Now go have yourself a wonderful weekend. Here are a couple sketchbook doodles I’ve done over the past couple of weeks for people that came into the gallery and invited me to hit up their books. This is the third tattoo I know of with my artwork. 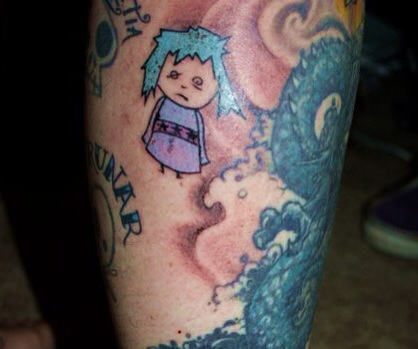 It’s very exciting to know there are fans that like my work enough to get it permanently added to their body. Thanks for the support, Laura!